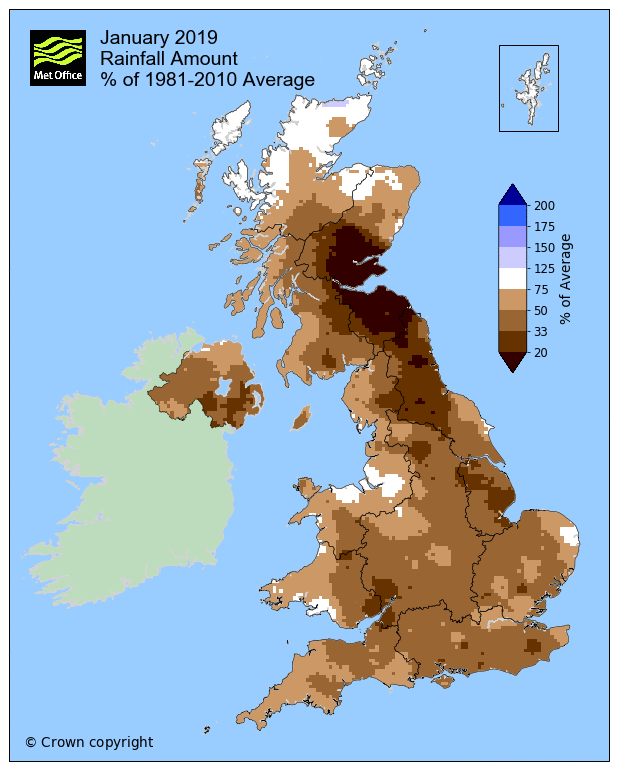 Experimental summary of Climate Forecasts for the UK for this and next month - updated as new data becomes available. UKMO 310119 - 5 February to 1st March 2019 - Less cold with rain and hill snow spreading from the west (may not reach some eastern areas). Drier and colder generally around mid month although the NW may remain unsettled. Later in February probably colder, possibly drier more widely but with wintry showers in places. Uncertain whether further pulses of milder wetter weather (hill snow) may spreading from the west. UKMO 290119 - 2 to 26 February 2019 - Cold with chance of turning even colder although the south may see some temporary milder spells. Rain/sleet and at times snow are likely. Increased risk of significant snowfall even in England, but no specifics. Windy at times. UKMO 240119 - 29 January to 22 February 2019 - Fairly unsettled with rain or showers and hill snow, risk of some snow to lower levels in places. Colder than normal with risk of frosts. Later in February chance of milder wetter weather for the S/SW of UK bringing an increased risk of snow on northern edge of any rain areas. 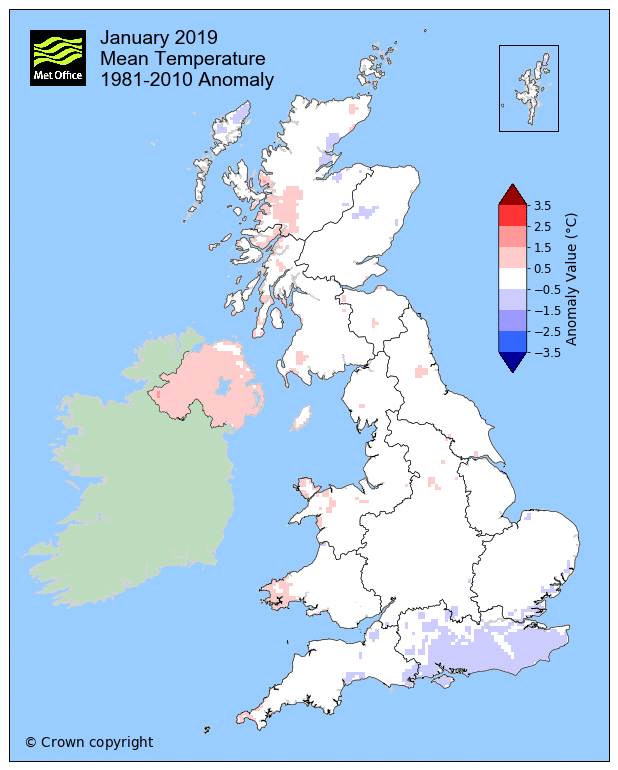 UKMO 180119 - 23 January to 16 February 2019 - Generally cold, frosts at times. Some showery snow sleet or rain spreading from the east. Risk of longer spells of rain at times in NW, falling as snow over hills and perhaps lower levels at times. Risk in February of rain sleet and or snow spreading across the south of UK - northern extent uncertain as are areas for snow risk, though not confined to hills. UKMO 150119 - 21 January to 14 February 2019 - A cold period is likely with more frequent frosts. Some unsettled spells bringing windy weather with rain and hill snow are likely, some snow possibly to lower levels too. Later parts of N/NW becoming drier but the south may remain more changeable with increased but uncertain snow risk in early February. UKMO 080119 - 12 January to 5 February 2019 - Unsettled with rain or showers and hill snow, mainly in the N but at times further south but the south likely to see the best of the drier weather. Some milder spells but often near normal and later into February turning colder. UKMO 020119 - 7 to 31 January 2019 - Initially a good deal of dry weather, cloudy at times with a little drizzle in the North. Risk of fog and frost especially in South. Becoming wetter and windier in the north around mid month with snow mainly on hills. Elsewhere still mainly dry but with less frost and fog risk and trending milder for a time again in South. Later in January uncertain risk of much colder weather with increased risk of fog frost and snow. 28day mean - Temp below normal PPN below normal PMSL S below normal N above normal (SW but slack in South implies variable patterns). 2F-8F TEMP: below normal PPN: below normal b ut Eire and N ireland above PMSL: above normal (WSW but slack in S). 9F-15 TEMP: below normal PPN: below normal but England above PMSL: N above S below (slack) . 16-1M TEMP: below normal PPN: below normal but far SW may be above PMSL: below normal. 28day mean - Temp below normal PPN below normal but SW England above PMSL NW above elsewhere below (NW). 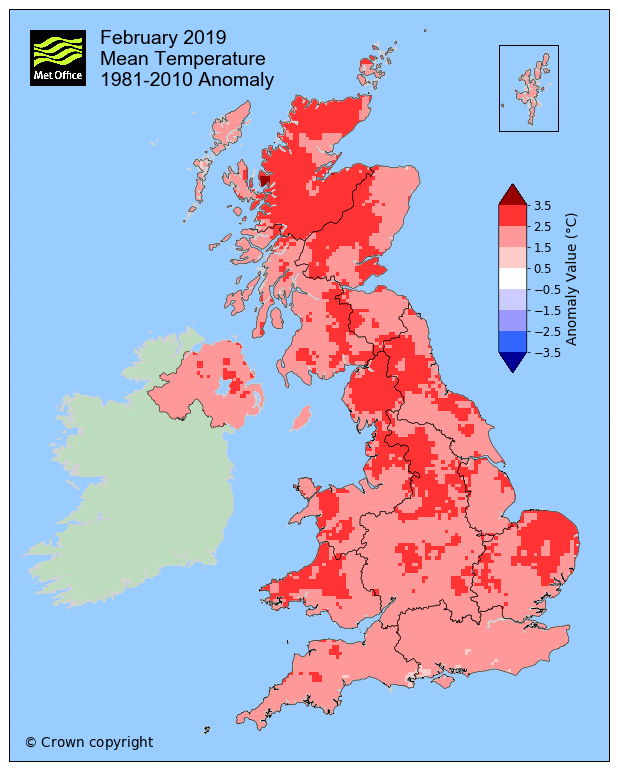 26-1F TEMP: below normal PPN: below normal PMSL: below normal (NW) High to W of UK. 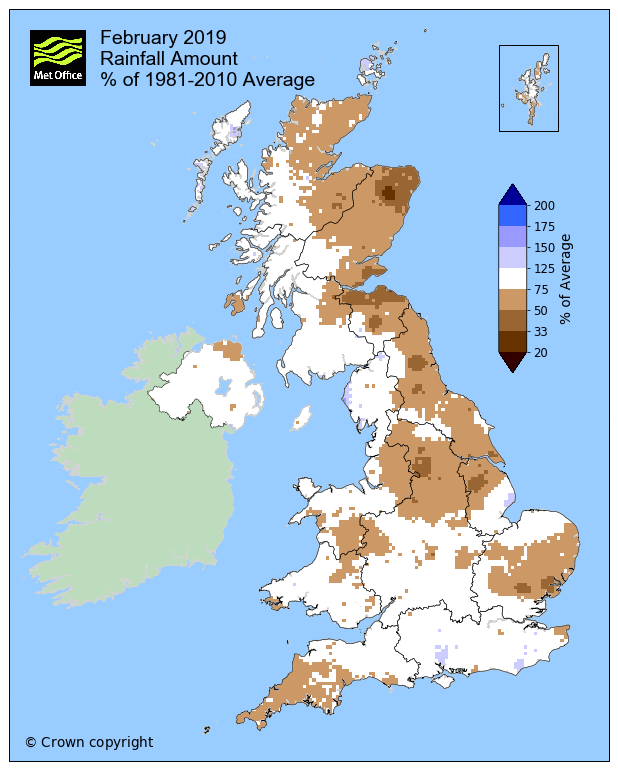 2F-8F TEMP: below normal PPN: below normal but SW England above PMSL: below normal (NW) High to W of UK. 28day mean - Temp Below normal PPN N below S above PMSL below normal or well below in S (W very slack flow). 19-25 TEMP: Below normal PPN: Below normal but SW above PMSL: S below or well below N slightly below (SLACK SE) . 26-1F TEMP: Below normal PPN: Below normal but SW above PMSL: Far N above S below or well below (E). 2F-15 TEMP: above normal PPN: above normal PMSL: nelow normal (SW). 28day mean - Temp below normal PPN below normal PMSL below normal (NW). 12-18 TEMP: above normal PPN: below normal PMSL: below normal (Strng WNW) . 19-25 TEMP: below normal PPN: below normal PMSL: below normal (NW). 26-8F TEMP: below normal PPN: below normal but above in S PMSL: below normal (NNW weak). 28day mean - Temp above normal PPN below normal PMSL above normal (SW) . 5J-11 TEMP: above normal PPN below normal PMSL above norma; (H over S W in N). 12-18 TEMP: above normal PPN: below normal PMSL: below normal (strong WSW) . 19-1F TEMP: above normal PPN below normal but risk of above in far SW PMSL: N above S below (SW).